Presenting a gorgeous early 19th century Chippendale style camel back sofa possibly made in Louisiana. 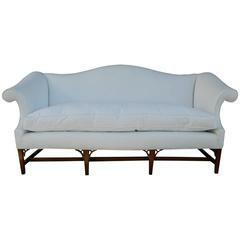 From circa 1820 this sofa is in the classic Chippendale camel back style with gorgeous carving and detail on the wood. Made of blonde walnut, unlike most British pieces which were made from mahogany. It also has a very ‘French’ influence and feel to the carving and decoration. It sits on four carved front legs with 4 support legs to the rear. It has been recently upholstered in a lovely crème damask fabric. It comes with 2 scatter cushions. The piece was purchased in Louisiana a considerable time ago and has remained in the same family ownership since. It is because of this family history, the light walnut and the style of carving which leads us to the opinion that this is a French inspired Louisiana piece. Provenance: From a Private Collection. In same family ownership for over 100 years. Condition: Very good condition. Some minor cracks to the wooden arm inserts and rear legs strengthened with brackets….but otherwise perfect. Very good condition. Some minor cracks to the wooden arm inserts (see photos) and rear legs strengthened from behind with brackets, but otherwise perfect. 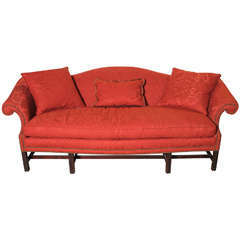 Early 20th century Chippendale style camel back sofa upholstered in red wool damask with nail-head trim. (Re-furbished). Front legs are carved. Three pillows. With silk damask-upholstered serpentine back, outward scrolling arms and seat; raised on square legs joined by stretchers; on casters. 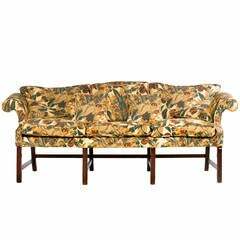 Chippendale style camelback upholstered sofa with single down cushion, late 19th century. Upholstered in Muslin.